Since I missed Costume College in 2013, I knew it was essential to my future health and happiness to make it to Costume College in 2014. The insanity I call my real life meant that getting any fabulous new costumes (including the much desired but impossible court gown) finished was a pie in the sky dream. However, I thoroughly enjoyed my "greatest hits" Costume College and am all excited to continue attending in the future, including offering to teach a limited class next year! Here are the highlights. After a very hot trip to the fabric district in LA, we went down to the welcome pool party. 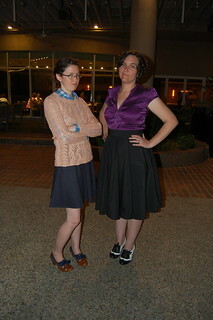 Aubry, of A Fractured Fairytale, and I went dressed as Sherlock and John from the BBC show Sherlock. No one got it, but it was still super fun. 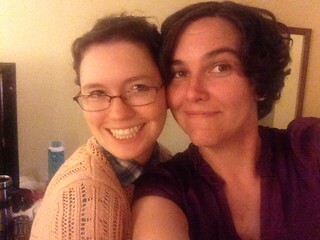 We were fashionably late so we missed talking to some people, but overall it was a lovely start to the weekend. 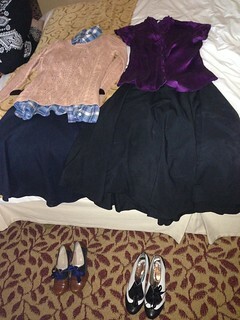 The outfits (since I don't think I got a single full shot). Update: I found one from Katherine! 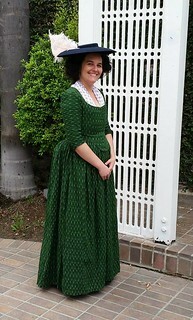 On Friday, I wore my one new gown - a white apron front dress from 1797 with my tried and true brown sleeveless spencer. I made the dress to go under the sari dress that didn't get finished (next year!) 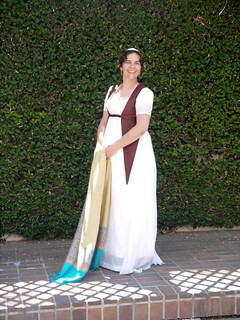 and it's going to be my new go-to Regency gown. I LOVED wearing it. I had one limited class, which ended up being less than amazing so I left it early to get ready for the Ice Cream Social. 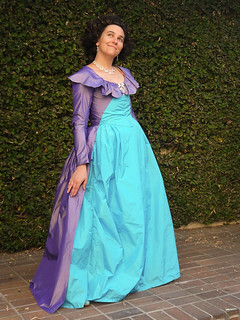 I'm so glad I did, because it meant I got to take pictures of the Portrait Dress in daylight. I forgot how much I love this dress too. The Ice Cream social was a blast and everyone looked amazing! 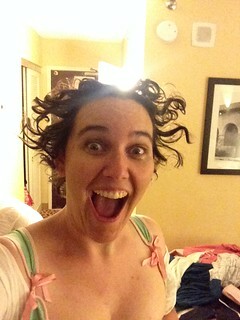 Taking my wig off after event led to one of my favorite selfies ever. I feel like this picture says everything you will ever need to know about me. 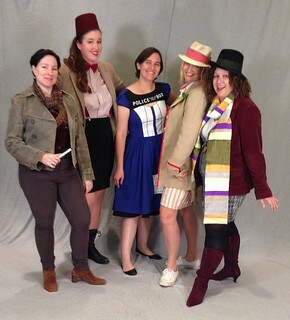 I didn't really feel up to wearing a corset so I just wore my TARDIS dress to hang out with the Doctor Who group. I got a super late start to the day so it ended up being the perfect choice. Next up was the Gala, and I wore my favorite dress ever to it. 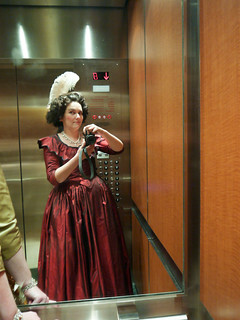 The Red Figured Silk gown I originally made for Williamsburg. Again, I arrived to the Gala fashionably late so I don't have full body pictures, but I accessorized with Jenny-Rose's vast collection of jewelry. 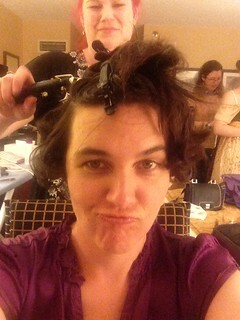 I got absolutely hammered at the Gala. There was stripping, drunken singing, terrible dancing, and inappropriate gushing over my favorite costumers. I told a lot of people to get on my level. And then I went upstairs to throw up and pass out. Good times! I woke up on Sunday surprisingly hangover free. Go me! I almost didn't get dressed up, but I last minute decided that I could wear a corset. So I threw on the green ikat and went to a couple of classes. Picture shamelessly stolen from Rebecca. The best class was easily the Friendship Bag class with Angela Burnley of Burnley and Trowbridge. Expect a detailed post about my bag when I actually finish it. I intend to make a bunch! So that was Costume College! I had great fun and met awesome people. I also reconnected with a bunch of people I've missed seeing for a while. Hopefully all this blogging will get me back into the swing of things and I'll have even more new costumes to share soon. You look so fabulous in everything, but that green ikat dress is my favorite of all. I want to steal that one from you!!! Oh I missed your burgundy dress! That makes me sad! AND you wore your portrait dress? AAAAh! I would have loved to have seen them both! You look so fabulous in them both!